You can already do so much with Facebook Messenger. Which is why more than 1 billion people have the app installed on their phones. And now, thanks to a new update, Messenger has some new tricks up its sleeve. All of which will be especially interesting to those who do video chats. Messenger is insanely popular, with an installed userbase of in excess of 1 billion people. However, Messenger has some competition in the form of (teenager’s favorite) Snapchat 7 Reasons Snapchat is a Teenager's Favourite Social Network 7 Reasons Snapchat is a Teenager's Favourite Social Network The latest craze amongst the adults of the future is the secretive photo-sharing service Snapchat. Why do they love it? Read More . Which is why Facebook keeps pushing new features. And this latest batch even manage to be quite original. Facebook and Snapchat are currently engaged in a titanic struggle for supremacy. Facebook will probably end up just acquiring Snapchat, but in the meantime the social network has added a host of new features to Messenger. All of which are designed to make video chats more fun. First, there are animated emotions based on the basic emojis What Does This Emoji Mean? Emoji Face Meanings Explained What Does This Emoji Mean? Emoji Face Meanings Explained Confused by the emojis in that text message you just got? Here are the commonly accepted meanings of popular emojis. Read More . These can be used to express love, laughter, shock, sadness, or anger. They’ll surround your face once and then disappear, letting you react to a particular moment without being stuck like that for the rest of the chat. There is also a range of new video filters, such as black and white, red, and yellow. These can be tested in private, and then turned on or off as your mood dictates. Messenger has also added a bunch of new masks and animated effects which you can use to add sparkle to your video chats. 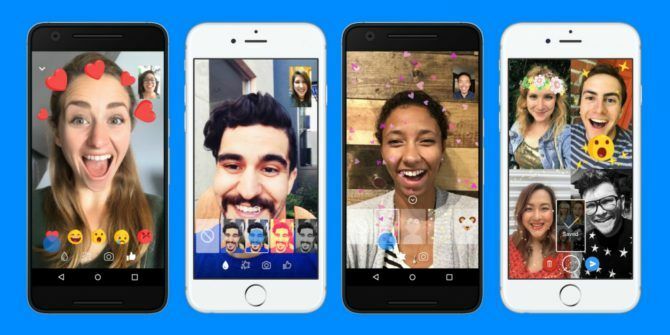 Last but not least, Facebook now lets you capture a photo of your video chat to share with friends who suffer from the FOMO. All you need to do is tap the camera icon and a photo will be added to your camera roll. You can then share it via Messenger or any other social networking sites. Messaging apps are meant to be fun. After all, you’re hardly likely to use these platforms to share bad news Google Search Buries Bad News Google Search Buries Bad News Google is making some serious changes to Search. The main aim is to bury the bad results from bogus sources, promoting accurate results from authoritative sources. Which sounds fantastic, if it's possible. Read More . So, with that in mind, Facebook is right to focus on making Messenger video chats as much fun as it possibly can be. How long until Snapchat one-ups Facebook yet again? Do you have Messenger installed on your phone? Did you install it by choice or was it already on your phone? Do you regularly use Messenger for video chats? If so, what do you think of the new reactions, filters, masks, and effects? Please let us know in the comments below! Explore more about: Emojis, Facebook, Video Chat / Call.